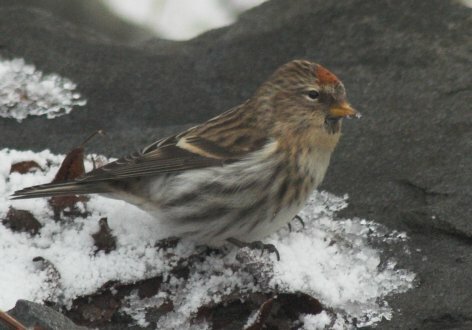 Yesterday I noticed a mixed flock of Pine Siskins and Common Redpolls in the trees near Crescent Harbor. There seemed to be at least a couple of different smaller flocks in the general area that were loosely associated. Most of the flock in my immediate area was feeding in a sizable alder next to the sidewalk. They were working the alder cones over looking for seeds to eat. Occasionally I saw a redpoll or two fly down to the ground and stay there for a few moments before flying back up to the tree. I did not think much about this at the time, as I just assumed they were picking up seeds off the ground like I have observed on previous occasions. However, after looking at the pictures I took, I was not so sure. 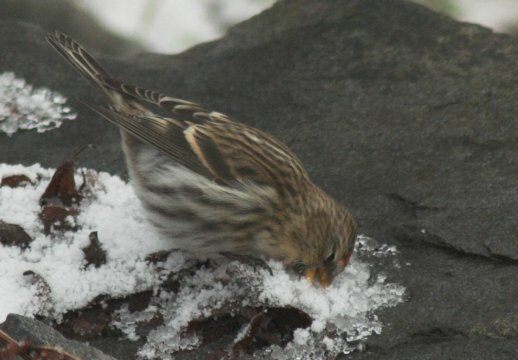 In one of the photos, it sure looked like the bird was scooping up snow. 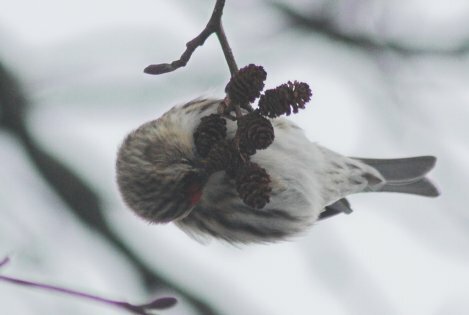 If the bird was going for seeds, I think it would normally pick at them rather than putting its whole beak down into the snow. Although I had never thought about it before, this is probably how these birds get water in winter. This is a species that regularly spends the winter in cold climates where liquid water is probably not common, so snow is probably their best source of water there. Since the there was no puddle of water close by the tree where they were feeding yesterday, it made sense for the birds to take advantage of the snow that was available if they were thirsty.